Beginning in 1996, Ka Hale Pomaika`i (KHP) has provided a valuable resource on Moloka’i through a Recovery Oriented System of Care with wrap around services which support consumers to recover or maintain abstinence from alcohol and other drug misuse. KHP uses state Certified Substance Abuse Counselors (CSAC), Certified Prevention Specialists(CPS), Certified Criminal Justice Addictions Professionals (CCJAP) and Peer- Recovery Partners with long-term recovery who have “been there” to provide addiction treatment, recovery advocacy, transportation and peer mentoring. KHP collaborates with many local community agencies by offering Substance Use related assessments, treatment, a sober living home and support programs for their referred clientele. KHP offers a site for supervised workers to fulfill community service obligations. Classes for court ordered Impaired Drivers who need “SARP” are available as well. 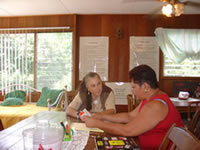 KHP also offers a variety of customized Employee Assistance Programs (EAP) for Moloka’i businesses. The programs KHP offers are designed to reduce recidivism and relapse in recovering adults who may have chemical dependency issues. Referrals for clients who do not fit into the KHP program (such as those with severe mental health issues, medically fragile people and consumers who are continuously involved in illegal activities) are made to the appropriate agencies which support the consumer’s best avenue towards wellness. To the greatest extent possible, Recovery Partners assist them in securing these services and work with them to enhance their motivation in addressing their issues. When these clients become stable and able to benefit from the KHP program they are encouraged to reapply for admission. Ka Hale Pomaika`i practices and trains staff in best practices and evidenced based program along with continuous education of ongoing new research and promising model programs. We understand that one program model does not fit each person. We strive to develop recovery programs that enhance one’s progress; support the individual new to recovery and provide opportunity for sustained sobriety for each participant. Designed with the uniquely Hawaiian composition of the island of Moloka’i in mind, KHP combines traditional best practices/evidenced based models with the use of Hawaiian values, Hawaiian terminology and objectives to achieve reintegration of the addict into their natural community.